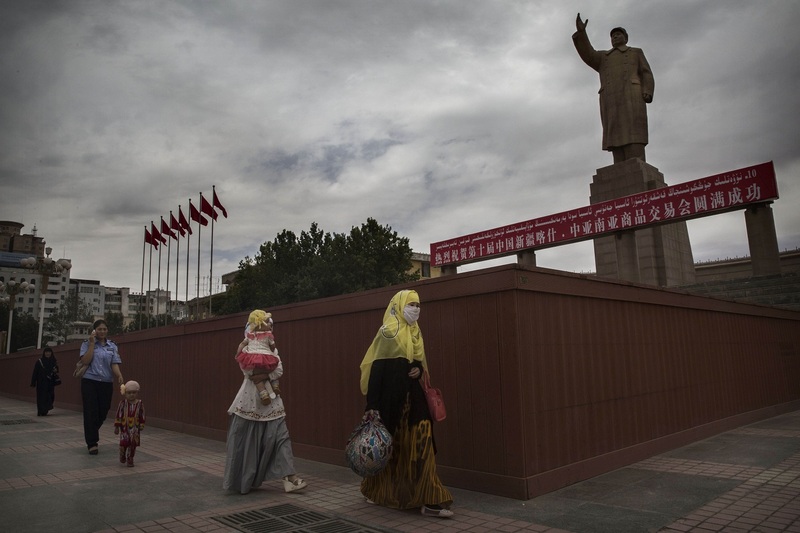 A Uighur woman walks past a statue of Mao Zedong, Kashgar, Xinjiang Uighur Autonomous Region, China, July 31, 2014. During the 1980s, as an idealistic, ambitious Uighur growing up under repressive Chinese conditions in the city of Kashgar, there was one nation to which I pinned my hopes for freedom and democracy. To me, the United States was a symbol of my aspirations to live with dignity. I was not alone. Educated and ready to make a mark in the world, many of my Uighur friends and I felt we would never receive fair treatment as an ethnic minority in China’s closed society. We admired the American government system and its democratic values. Some of those educated Uighurs, myself included, left China in the 1990s, saving ourselves from the jails in which the authorities liked to imprison free-thinking individuals. Uighurs are a Turkic Muslim people whose homeland (called East Turkistan by many Uighurs, and Xinjiang by Chinese) has been under Chinese Communist administration since 1949. China’s tarnished human rights record in the region is well-documented and necessitates close monitoring from the international community. U.S. presidents George W. Bush and Barack Obama did not emphasize China’s mistreatment of Uighurs, though they both occasionally raised the issue. Nevertheless, I am concerned Donald Trump’s presidency will reverse America’s historic commitment to promote human rights and democracy around the globe. His ambiguous relations with some of the world’s most egregious dictators not only emboldens them to commit rights violations, it sends an unequivocal message of zero support to dissidents who have made considerable risks to create a fairer world. America’s foreign policy should not be only about deal-making on trade and security issues. Rather, it should also promote American ideals—respect for individual rights, pluralism, democratic freedoms—in diplomatic engagements. On April 6-7, Trump will meet with Chinese President Xi Jinping for the first time at the Trump-owned Mar-a-Lago resort in Florida. The U.S.-China relationship holds great importance not only for the two countries, but also for global trade and security. The first face-to-face meeting between Trump and Xi will offer insights into the direction this relationship will take in the next few years. Despite all the talk of a “very difficult” meeting, human rights concerns have been shelved. The U.S. administration believes the discussion of human rights only serves to alienate the Chinese leadership. Less than a week before the Trump-Xi meeting, Beijing implemented further curbs on Uighur religious belief and practice through the “Xinjiang Uighur Autonomous Region Regulation on De-extremification,” the most draconian in a series of laws limiting Uighur religious freedom. The new law ostensibly targets “extremism.” However, the absurdity of its provisions demonstrates the extent to which the Chinese state goes to deny Uighurs fundamental human rights: the regulation’s ban on “spreading religious fanaticism through irregular beards or name selection” being a noteworthy example. For his part, Trump has not been quiet about China’s human rights record. Instead, he has shown a begrudging respect for China’s strength through authoritarianism. Shortly after the 1989 brutal crackdown on democracy activists in Tiananmen Square, Trump praised Chinese leaders for the strength they displayed in quelling the protests. And during a March 2016 GOP debate, he referred to the Tiananmen pro-democracy movement as a “riot.” Trump has also indicated he would end the U.S. policy of promoting democracy around the world. This is a distressing stance that should garner more criticism among Republican colleagues. Why is a president from the party of Ronald Reagan showing that kind of warmth towards the authorities in Beijing, and such indifference to the struggles of people living under Communist repression? Trump has gained support from voters—including individuals in my own Uighur community—who hold an unfavorable opinion towards China. This is based on his depictions of China as one of America’s adversaries on economic issues, cyber security, and tariffs. He also has hinted he wants to beef up the U.S. military presence in the South China Sea to deter Chinese territorial claims. While these policy positions bother the Chinese, they believe Trump is not able to accomplish these goals given congressional opposition and his inexperience in world affairs. In short, Beijing does not take his aggressive rhetoric seriously, and sees it as a device to show toughness to the American electorate. His presidential campaign also was a godsend to China’s unelected leaders; they readily used his soundbites and tweets to show Chinese citizens the ugly side of democracy. In China, suppression and stigmatization of Uighurs are not just embedded in society, but also in state policy. This is why anti-Muslim rhetoric and executive orders emanating from the White House has disturbing implications. Trump’s divisive actions are music to the ears of Beijing’s authoritarians. It echoes their own politically motivated assault against Uighurs, and in doing so justifies it to the rest of the world. As American diplomats often say, the U.S.-China relationship is the world’s most important. The challenges we face in our dealings with China are enormous and enduring. Nevertheless, we are strongest when we are true to our democratic values. When we ignore or downplay human rights in our foreign policy, it undermines the moral authority that forms the bedrock of American power. When we stand up for our values, it reinforces our allies’ confidence in America’s resolve on a range of issues beyond human rights. America’s human rights advocacy with China can achieve success when it is argued unapologetically, vigorously, and publicly. Trump’s silence on China’s human rights violations diminishes American strength on the international stage and brings China one step closer to global ascendancy.